I think it will be interesting to see how both the Western and European supply chains will survive with the continued growth of the Asian supply chain. Their growing dominance in both the apparel and textile markets will serve a threat to the markets that exist in the WH and European supply chains. Despite attempts to keep production in the WH, such as NAFTA, only 15.7 percent of imports come from within these regions. If countries in the WH continue to import textiles from the Asian Hemisphere, the U.S. textile industry will deteriorate. Similarly, if the U.S. continues to import apparel from Asia, then countries such as Canada and Mexico will lose business. It’s interesting to see how even though countries in the same hemisphere, such as the U.S. and Mexico, have different economies and are in some way competing with one another, they still depend on each other for business and become a team when it comes to trade because they lie in the same hemisphere, and want to create strength in their own hemisphere in order to compete with the Asian supply chain. 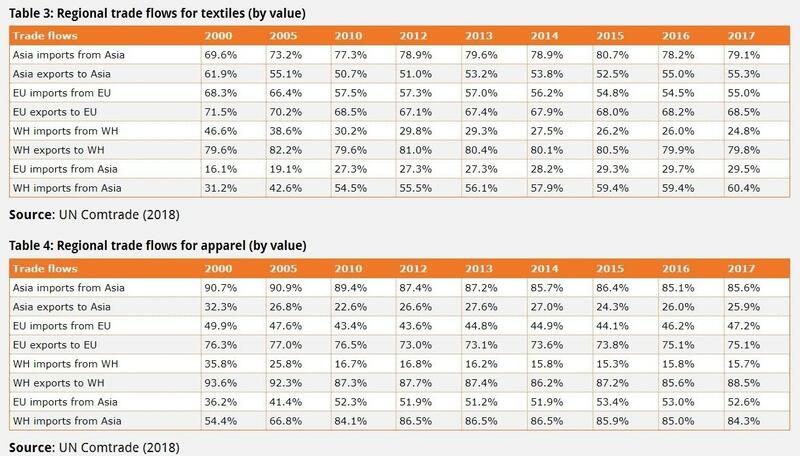 Despite increased competition from Asian markets, I do not believe the U.S.’s textile production market will ever disappear completely. Not only is the U.S. very capital intensive, but is also rather technologically advanced compared to many other countries and regions around the world. Our access to and continuous utilization of new technology allows us stay competitive with other textile manufacturers. Companies that are especially “safe” from competition are those such as GoreTex who primarily serve a niche market. I am predicting that Asian countries will become a stronger powerhouse when it comes to sourcing just within their region. This will keep traveling and other costs down. By supporting the countries within the region, they support their partners and help their economies. It seems like the rest of the world must simply sit and watch, and negotiate for bilateral agreements. When it comes to the US-Japan FTAs, White House spokeswoman, Sarah Sanders said that Trump, the Indian Prime Minister, and Japanese Prime Minister plan to deepen trilateral communication and acknowledge the importance of the free and open Indo-Pacific vision. India has been known to not be involved in alliances with partners, so I am interested to see how they might cope with this idea. Previous Previous post: What Do You Take Away from FASH455?